Andrew Cayton begins his study with a blunt question: why did readers care so much about the story of Mary Wollstonecraft’s sad love affair with Gilbert Imlay? The story, told by William Godwin, Wollstonecraft’s husband, in the memoirs he wrote after his wife’s death in child-bed, is all too familiar. It is the story of a woman first seduced and then scorned. Cayton’s immediate answer is that people cared (and continue to care) because Wollstonecraft had so effectively challenged the patriarchal system of values to which she seems, in relation to Imlay, to have fallen victim. How could one of our first, and perhaps still our most effective, feminists have succumbed to the charms of a roué? How could despair at his behavior have prompted a suicide attempt by such a strong and vital woman? Wollstonecraft’s Vindication of the Rights of Woman rejects the notion of conventional marriage based on property, family, and masculine privilege; it endorses instead unions of “natural commerce” founded on “desires,” “self-interest,” the pursuit of “happiness,” “bonds of social affection,” and mutuality between men and women (5). Early on, Wollstonecraft herself cultivated a concept of ungendered “manliness” of character—that is, a “natural openness, a willingness to cry at the plight of others, or the courage to endure pain” (19-20). Yet, in the crucial episode of her life, she dedicated herself to an unworthy partner, and she indulged despair over his wayward and fickle nature. How do we account for Imlay without discounting Wollstonecraft? That the study answers this question is one of its chief strengths. Following the 1792 publication of her feminist manifesto, Vindication of the Rights of Woman, Wollstonecraft found herself in revolutionary Paris. It is here that Cayton begins, quickly backtracking to her early years to demonstrate Wollstonecraft’s longstanding (by this time) commitment to the self-fashioning that would distinguish her time on earth. Rejecting the authority of an abusive father, the adolescent Wollstonecraft had embraced an alternate “family” in her close friend Fanny Blood. After Blood’s death, the devastated and impecunious Wollstonecraft traveled to Ireland as governess for an aristocratic family. Here, she combated loneliness by turning to the friendship of books—the many books she read and the one book she wrote. Her Thoughts on the Education of Daughters (1787) eventually proved a passport to another kind of family—that of the London literary circle sponsored and supported by publisher and bookseller Joseph Johnson. It was within this group that Wollstonecraft began to formulate her theory that only equality between the sexes and marriages based on mutual love and respect rather than on property and masculine prerogative would bring needed and permanent social reform. These are ideas central to her most famous work. These were also beliefs which were embraced by many men in Wollstonecraft’s set. But social reform proves slow in coming when abstract ideas begin to govern actual behavior. When Wollstonecraft proposed to artist Henri Fuseli, with whom she enjoyed an intense, mutual friendship, that she live with him and his wife on terms of intimacy, Fuseli (prompted by his wife) refused. And Wollstonecraft retreated once more into solitude, friendlessness, and writing. It was at this point that she traveled to Paris. Solitude characterized Wollstonecraft’s life in France in December 1792, but by spring that year, things had changed. She finally found the mutual love for which she had been searching: Gilbert Imlay, the American writer. Wollstonecraft met him in Paris, and by the spring of 1793, one year later, they were acknowledged “sweethearts” (56). Cayton is particularly effective in his depiction of Imlay, whom most literary historians have relegated to the status of “feckless male” (57). He was certainly an adventurer, but, as Cayton explains, he was not “a precursor of unscrupulous nineteenth-century capitalists” (64). Nor was he exploiting Mary Wollstonecraft for her ties to literary circles, for he had forged such ties on his own. 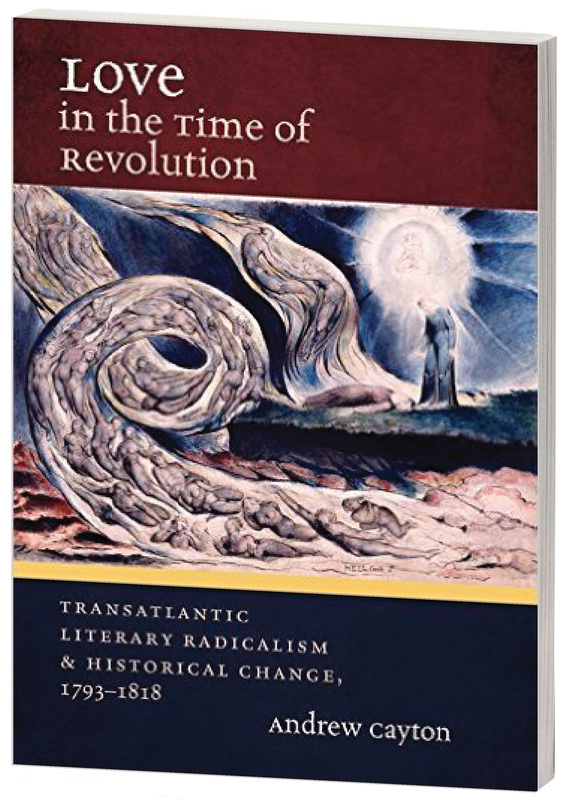 Imlay, as Cayton persuasively argues, is best understood as “an ambitious young man trying to make his way in a radically unstable revolutionary environment” (67). There is no need to regard his affair with Wollstonecraft as insincere or venal. He seems to have been as caught up as she in the fervor of sexual passion, revolutionary hope, and all the changes—personal and social—that hope portended, though eventually other matters would distract him from the pursuit of egalitarian love. Ultimately, as we know, Imlay was the source of great sadness for Wollstonecraft. But Cayton cautions that the end of an experience is not necessarily the sum of its value: “even if we explained what was coming, who is to say that [Wollstonecraft] still would not choose as she did, recognizing that her time with Imlay was ultimately as much a part of her as her time without him? Love might cause pain, but a life without intimacy, however fleeting, was no life at all” (90). Mutual love founded on conversation between equals insures individual independence through the interdependence of mutual growth. Social commerce and economic commerce are aspects of the same phenomenon, both of which are tied to equality between the sexes, i.e., the ideal of love Wollstonecraft pursued. Increasingly, as the instability of the times opened riskier financial opportunities for an adventurer like Imlay, Wollstonecraft’s lover chose pursuit of financial gain over his relationship with her. Other women certainly came into the picture—but they weren’t the “deal breaker.” It was, instead, Imlay’s fading belief in the vision of mutuality Wollstonecraft demanded. His belief was in the independence guaranteed by the possibility of divorce, not the mutuality promised by the possibility of choice in marriage. The emphases are distinctly American on the one hand and British on the other. As it happens, however, Imlay’s individualistic commitment to the possibilities of financial gain in a turbulent political climate provided, albeit inadvertently, Wollstonecraft’s ticket to the kind of emotional intimacy he denied her, one she had been seeking for so long. Sent by Imlay to Scandanavia to conduct some business affairs for him, Wollstonecraft discovered a new voice. Letters Written during a Short Residence in Sweden, Norway, and Denmark, published by Joseph Johnson in 1796, reveals a “vivid” style unlike Wollstonecraft’s previous works: “the details are concrete and the tone personal, the whole a merging of the plot of a travel account with the sensibility of a novel” (126). The author comes across as “an extraordinarily sensitive and self-aware person engaged in an unstable conversation with her self about who she was” (126). Though William Godwin, also part of the Johnson set, had met Wollstonecraft before, he had not been particularly interested in cultivating a friendship. When he read Letters, however, he fell in love. Indeed, the two were a brilliant match philosophically, each committed to the notion that “justice would flourish when individuals freely acknowledge they need one another” (153). A “well-considered love,” in particular, offered the surest route to justice as in such a love “mutuality was the foundation of everything” (156). In their all-too-short marriage, Godwin and Wollstonecraft pursued the kind of love she had hoped to find with Fuseli and that she mistakenly thought she had found with Imlay. After her death, Godwin continued their joint project of mutual growth in the publication of her memoirs, which he undertook, according to Cayton, as an act of “social commerce," revealing to readers the progress of his late wife’s commitment to the ever-evolving self (167). Her indulgence of sensibility with Imlay was replaced, according to the narrative of the memoirs, by the rational, mutual love she enjoyed with Godwin. At this point in his study, Cayton arrives again at the place from which he started, and, to invoke T. S. Eliot, he and his readers know it for the first time. The reaction to Godwin’s memoirs of his wife was, both in his day and in ours, extreme. In his own time, the work accomplished the opposite of what he claimed to intend: instead of honoring the life’s journey of his beloved partner, the narrative tainted her reputation. To this day, scholars resent Godwin’s appropriation of his wife’s legacy. But the reason for such outrage, as it turns out, has little to do with Wollstronecraft’s (or Godwin’s) betrayal of feminist values and much to do with the revolutionary nature of the journey recorded in both the life of Mary Wollstonecraft and in her husband’s treatment of that life after her death. The Memoirs of the Author of “A Vindication of the Rights of Woman,” with its shockingly frank portrayal of the Imlay-Wollstonecraft affair, spawned what could almost be described as a sub-genre of literature in the many works produced on both sides of the Atlantic that radiated out from Wollstonecraft’s courageous (or reckless) pursuit of mutuality, “manliness,” and justice. The second half of Cayton’s book concerns the writers, including Godwin himself, whose work was defined (either positively or negatively) by “similar issues” as those raised by Wollstonecraft’s life and work (194). Most poignant, of course, is the story of Mary Godwin Shelley, whose life and literary achievement is presented as a full engagement with the lives and literary achievement of her parents. Her life was, in many ways, a “gauntlet of grief,” but, like her mother and father before her, Mary Shelley pursued “social engagement” through writing, creating, and sharing “characters living her dilemmas” as they demonstrate the “power of love to encourage mutuality between men and women” (319). Cayton’s full and sensitive treatment of a story we think we know well completely transforms each of the major players (Imlay, Wollstonecraft, and Godwin) as well as our sense of the revolutionary significance of the personal drama they all shared and the ideas bequeathed to their readers, to their children, and to us. 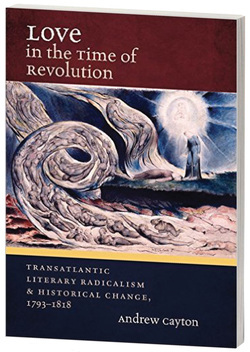 Love in the Time of Revolution: Transatlantic Literary Radicalism and Historical Change, 1793-1818. By Andrew Cayton. University of North Carolina Press, 2013.